Much is made of the overall Referendum result – 51.9 per cent Leave, 48.1 per cent Remain. There was a turnout of 72.2 per cent. The – European Union Referendum Act 2015 – that established the legal basis for the Referendum which was held on June 23, 2016, among other things, facilitated a “a guide was posted to every household in the UK and Gibraltar in the week beginning of 16 May 2016”. The 16-page guide – Why the government believes that voting to remain in the EU is the best decision for the UK – outlined the some facts and figures (industry export proportions to the EU, etc) but then included some scaremongering consistent with the lying data being pumped out by the Treasury etc about the disaster that would befall Britain if the Leave vote won. Very clear. The vote would be respected. And what was the vote about? That binary choice is as simple as it gets. The people were not asked to vote on any conditionality – deals with the EU etc. They voted clearly to LEAVE and the Government promised to “implement” that decision. 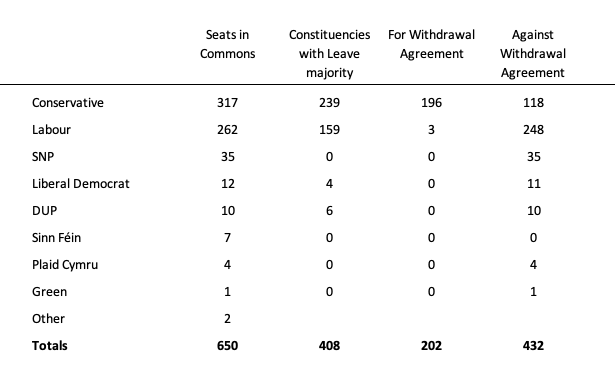 These counting areas were, however, not aligned with the 650 – Consistituencies – which elect MPs, who voted last night on the EU deal that the Prime Minister put before Parliament. For some in the press, it appears that that vote was about whether Brexit would go ahead or not. But it is hard to justify that position given that the people voted to LEAVE when asked and the Government assured them prior to the vote that they would “implement” their choice. 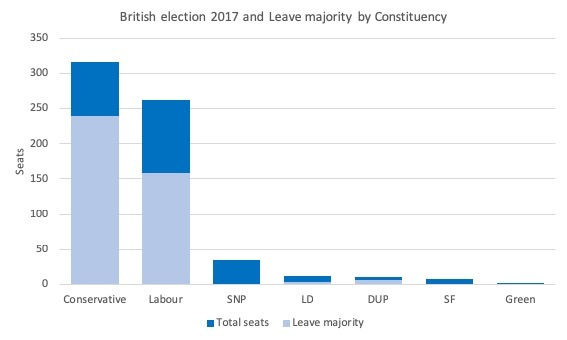 But what was of interest to me was how the Brexit vote was broken down by electoral constituency. There was some work done by a Political science professor at Royal Hollaway (Chris Hanretty) along these lines. But, these estimates were improved upon by the BBC in their Ward-level analysis – HERE – as a result of accessing more detailed data. On February 16, 2017, the House of Commons library published – Estimates of constituency-level EU Referendum result – which compared the Hanretty estimates with the Ward-level analysis by the BBC. The BBC explain that they were able to get certainty in 20 per cent of the constituencies and relied on modelling for the rest. Given that last night’s vote was by constituencies, I wondered what the Referendum vote was like broken down by this regionalisation. First, 62.9 per cent of the Constituencies voted to Leave. That means that 409 Parliamentarians were that sat in the Commons were representing electorates that voted to leave. 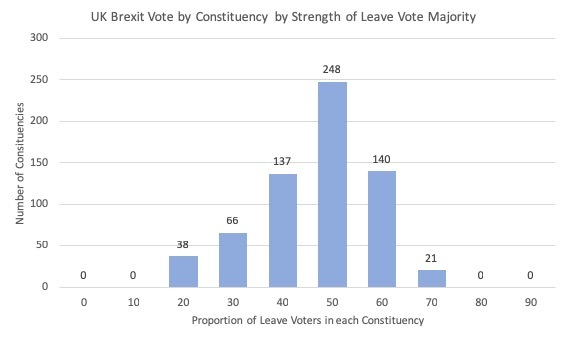 The difference between the 52 per cent of votes for Leave and the 62.9 per cent of constituencies voting to Leave is mainly due to the clustering of Remain votes in the larger urban areas. Spatial breakdowns suggest the Leave vote was more evenly dispersed across the UK. Second, 60.7 per cent of Labour constituencies most likely voted to Leave, 75.4 per cent of Conservative, 33 per cent of Liberal Democrat and 60 per cent of DUP. This graphic shows the breakdown. Third, I also plotted a histogram to see what the spread of the Leave vote by constituency was like. The horizontal axis shows the breakdown by the Leave vote proportion in each constituency into deciles. So, there were 248 constituencies where the Leave vote was over 50 but less than 60 per cent of the voters who cast their vote (and it was counted) and so on. Now the question I was interested in was the breakdown in last night’s vote by the Referendum result. The following Table brings together last night’s vote on the – European Union (Withdrawal) Act and the Referendum vote. I made the adjustments to the shifting Party composition of the Commons since the 2017 election and matched it with the voting outcomes last night for the Withdrawal Bill. So while the vote last night was not whether to ratify the Referendum outcome, the point is that the rejection of the Withdrawal Act is being cast as a rejection of that 2016 result and will clearly push the political trend towards either another Referendum or a revocation of the Withdrawal intention altogether. British Labour has claimed it will not support a No Deal Brexit. So my conclusion would be that there are lot of MPs in both the major parties that are not representing the views of their constituencies in this regard. The Labour Party is the worst offender. Which was what the Government assured the people it would do in the Leaflet they released in May 2016. Music to soothe a sore head! This is about all I can cope with today. The Art of Fugue by J.S. Bach played by the best interpretor of Bach, the Canadian pianist Glenn Gould. There are many theories about this set of pieces by Bach. Whatever they might hold by way of interest and I have explored several of them with some joy, the music is sensational even when played on piano (when originally probably conceived for harpischord – but then that is conjecture too). I originally acquired an earlier recording of the Fugues 1-9 (published 1962) by Columbia in the early 1970s which was Glenn Gould’s only organ recording. I loved it but the critics hated it. Philistines. This audio in the video apparently comes from two different albums released much later. The preferred compilation from Sony Classical Masters – Glenn Gould plays Bach – was released on March 25, 2011. Disc 6 has all the Fugues. On the video you hear the unfinished Contrapunctus XIV (which many composers have tried to finish – I prefer Gould’s clean stop consistent with the original manuscript) and Contrapunctus I.
Glenn Gould was eccentric but was also the best to date. Bill looks like you have those 75.4% and 60.9% share of Con/Lab constituencies wrong way round. Minor point in scheme of things, but the Remoaners will jump all over anything like that. An interesting analysis. But your underlying assumption is that the MPs represent all of their constituents, instead of the ones that voted for them. While in principle it should be the former, we all know it will usually be the latter! :) And this is particularly so in light of the Yougov poll (link below) which found that if people “Imagine that, at the next general election, the Conservatives and Labour supported going ahead with Brexit, whilst the Liberal Democrats[/SNP/Plaid Cymru] supported a public vote on whether or not to go ahead with Brexit…” then Labour would get 22% of the vote share and the Lib Dems 26%, while the Conservatives would retain over 40% of the vote share. Assuming this poll is even partly accurate it puts Labour (Corbyn in particular) in an incredibly difficult position where they (he) cannot be seen to support going ahead with Brexit but must implement it all the same if they (he) are to respect the wishes of their constituents. The problem is that while some Labour voters did vote for Brexit it was mostly Tory voters, and those voters won’t elect Labour regardless of Labour’s position on Brexit. It is clear that Brexit is, politically, a huge mess and Britian’s archaic electoral structure makes the math doubly important. Since Parliament is unlikely to arrive at a consensus on any viable option other than “No Deal” before 29 March, unfortunately there is some chance of a vote asking the EU to extend that date *if* some Tories or others are prepared to vote for it. Of course the only point in doing that would be to get a second referendum from which the MPs could get a fresh mandate more in line with what they want to do… but as one Guardian commenter put it, the only fair choice on a 2nd Ref would be between No Deal and May’s Deal (or some alternative)… let’s hope the MPs end up being forced to do the right thing in that regard. “Voting to leave the EU would create years of uncertainty and potential economic disruption. This would reduce investment and cost jobs. Then you go on to say that “The people were not asked to vote on any conditionality – deals with the EU etc. Now can you explain how your simplistic approach about a “no conditionality” LEAVE vote takes into account the decade long process in the context of which “the UK unpicks our relationship with the EU and renegotiates new arrangements with the EU …“? there is zero chance of labour supporting a no deal brexit. I’m glad you are recovering from the misery of the flu. I hope it continues at a faster pace than the seemingly endless Brexit dealings and non-dealings debates. I think when Bill says that it is a simple question, neglects to consider the background around the referendum. It was envisioned by the Cameron Government as a means to head off the threat of UKIP, and as a way of silencing his own coterie of anti-EU MP’s – in short it was a thinly veiled attempt for the Conservative party to hold onto power, which has backfired in a spectacular fashion. And then there was the campaigning. The Government presumed that if they just told everyone they would be worse off, people would vote with their wallets, forgetting that after 5 years of austerity, they had managed to create a whole swathe of the country who couldn’t imagine being any worse off than they already were. And these people genuinely believed that a leave vote would improve things. The other main component of the vote was around immigration, and largely these people lived in areas least impacted by immigration. Meanwhile for the last 40 odd years, the UK media have focused on the EU as imposing on Britain. The vast majority of these stories turn out to be myths, and in fact it got so bad that the EU actually devoted a page to debunking them, and there are literally 100’s of entries. Most people in the UK have very little knowledge about how the EU actually works – for instance it will come as a surprise to most people that the Council is actually composed of the leaders of the EU nations, and that Tusk is not much more than a glorified spokesperson. And I think the other point is that Bill in advocating a no deal exit doesn’t have to live here with all the ensuing chaos. Take Dover for instance – it takes 10,000 lorries per day, but after a no deal exit each of the 99% of lorries from the EU will be subject to a customs check, which takes between 5 and 45 mins. With just a 2 min delay to each lorry will cause a tailback estimated to be up 17 miles along the M20 (and they chose the 2 mins because this was the proposal for a computerised customs system which is years away from being implemented). And then you need to consider Northern Ireland… A no deal scenario would be in breach of the Good Friday agreement, which is the treaty which allowed powersharing in Stourmont. And the last thing any of us want is a return to the situation which existed prior, which a no deal risks. And the last thing Bill suggests is that a no deal exit would increase our bargaining power – it won’t with the EU, that’s for sure. The only thing it will do is annoy them more than they already are. And this was the mistake the British Government made – they assumed that the EU would prioritise economic interests over political ones, and the EU has steadfastly prioritised political over economic interests. Indeed when May went to the EU to ask for a legal instrument which would commit both parties to ending the backstop as quickly as possible, the EU refused on the grounds that they would only help out member states. @ Mark Redwood – for sure sure there will be disruption, some of it serious. But the point is that we here in places such as Australia and New Zealand have already lived through a situation where Mother England simply dumped us to join the precursor to the EU, resulting in panic back in the day since both countries relied on Britain to take half their exports. And yet, here we still are – the skies did not rain blood, plagues of locusts did not scour the land, the Four Horsemen of the Apocalypse did not sweep the country and airports were not shut down by waves of hysterical drone sightings (I can’t believe a Guardian columnist actually tried to insinuate that Brexit was behind that – must have been a slow news day). After an adjustment period, both countries came out the other side and grew and thrived on their own. Just as the UK will post-Brexit – providing it’s leaders do not simple throttle growth with austerity. I agree with Bill. I reckon the EUers fear a hard Brexit most of all. On the trade side, various EU countries will suffer and there is of course the fear that Brexit will be the forerunner of subsequent exits and the demise of a consolidated Europe. RE Bach’s fugues as played by Gould. It hardly sounds like Bach. Is this the tempo Bach specified? Thanks for your comment and your poor attempt at misrepresenting the point I was making. The Leaflet published in May 2016 by the Government was not a statement of conditionality pertaining to the binary vote. It was a massive piece of scaremongering with all sorts of Project Fear estimates of what would happen if the people dared to voted against the Government’s recommendation to Remain. Virtually none of the Treasury predictions, for example, for the period after the Vote came close to reality. The facts are that the people were asked Leave or Remain – that was what the Vote was asking. And the Government promised to implement the choice that resulted. That is the democratic imperative for Britain no matter what. @Henry Rech – I think both you and Bill are making a fundamental misreading of the EU. The UK Government believed when they went into the negotiation that because EU trade with the UK was so significant they could use this as a lever in their negotiation. They were warned by the UK’s chief ambassador that this would not work, for which he was heavily criticised in the UK. It turned out he was right. The EU was primarily set up to prevent a future a war in Europe. It’s founding statement was to seek “ever closer union” which the UK exempted itself from in 2016. To understand monetary union as solely an economic arrangement is to misunderstand it’s actual purpose, which is basically how the UK has treated being a member of the EU – we are in it for economic advantage. Brexit for the EU represents an existential political crisis for the EU – the EU was always intended to be unleavable, and for a nation to leave and secure free movement of goods and services, without free movement of people is and always will be untenable to the EU. It would threaten the very existence of the EU, and so the EU can not agree such terms, but the UK still asked for it anyway. The point is that a deal any deal must always be at the disadvantage of the nation leaving. The 2 year deadline was deliberately conceived to cede a negotiation advantage to the EU. If we do leave with no deal, then that must be even more painful. The UK can not expect the EU to co-operate. Even if this were in its economic interests, it would not be in its political interest. The current backstop deal only exists, not primarily because of a UK negotiating success, but because the UK would not accept a border between NI and the mainland UK, and without an agreement the Irish Government would have faced a serious risk of collapse. The EU acted to save the Irish Government. The EU does not like the backstop arrangement, but they will not agree to it being temporary, nor would they agree to May’s suggestion of using a legal instrument to compel both sides to end the backstop as soon as possible, even though this would have of improved her chances of getting it through parliament. Again this was purely a political decision, there is no legal or constitutional bar which prevented them. Have you read my 2015 book – Eurozone Dystopia: Groupthink and Denial on a Grand Scale? I think there are around 520 pages of understanding of how the EU operates and of its long history. The ‘purpose’ of the EU has shifted from the Jean Monnet/Robert Schuman days. It shifted during the 1980s to become a vehicle for corporatist/financial neoliberalism. It is a mistake to continue to think of it terms of early post WW2 Franco-German peace pacts. you seem confused by all the political smoke & mirrors that have been put in front of you. I voted against in 1975, accepted the result and although regretted the consequences, argued my case now & then, I got on with my life. The Gov of the day had been putting everything in place, from admin, regulations and infrastructure since 1970 in order to make the transition. Including screwing over the Commonwealth. No one belly ached about the chaos then, they / we just got it done. All Bill is saying as an outside observer, looking impartially at the Referendum choices, is that it was stay or leave. Not procrastinate until the the mess was too big to clean up. That’s the trouble with everyone today who doesn’t work for a living, a decision is made and instead of getting started on the work, they argue, have meetings and stare at their navels, hoping someone else will do it. Or if they leave it long enough it will not happen. The point is that if any of the MP’s or establishment were serious about leaving they would have started on the changes 2.5 years ago. New port facilities, new regulations, new industry support etc etc. If Genghis Khan is coming be prepared with fortress and defenses before you negotiate or he will sweep you away. This Gov and the opposition have totally failed to at least be prepared & enter a real negotiating position. They have let both the Leavers and the Remainers down. The rest of your belly aching about lorries, pain, no deal, EU advantage, NI border should not even have been an issue if the UK had mobilised it’s resources and solved the transition. 2.5 years was plenty of time, we had 5million men enlisted and millions of tanks, planes & armaments built in less time from 1940-42. Needs must, too many people talking / twittering and not doing. Gould’s Goldberg Variations is one of my all time favourite recordings. Much like this one if you listen carefully you can hear him humming along as he plays. I think it adds to the experience, but his critics pretty much slammed him for it. To ucumist on planning for a no deal ,shoulda coulda didnt. So what now. the referendum ballot this impasse was predictable. when it comes to the labour party there is no left right split. yes cognitive dissonance abounds the left support the neo liberal eu. It is hard to rise above the tribal some of us try. kevin harding:- “brexit is driven by and emboldens right wing politics”. “It is hard to rise above the tribal some of us try”. If this post is your attempt at doing that, believe me it fails. It seems to me you are saying as much as what I was saying – the EU cannot/will not countenance any member country’s exit. To me this is its achilles’ heel. I don’t understand the intricacies of the backstop agreement so what I am about to say is probably stupid. I believe that the UK was to pay the EU P50b (including EU subscriptions till 2021). Why not go for a hard exit and compensate the Irish/Northern Irish for trade losses/hard border with the saved P50b (including tossing some to the restive Scots)? The UK would then be free to do trade deals with whomever it likes. Robert h well I was insulting myself then being a left wing brexit voter. And someone who has stood to applaud tonny benn on many occasions. put 90% of labour members supporting a second vote. no no for me to even discuss my support for brexit with many of my left frirnds and family. Kevin, if the Labour party is now Blairites and Momentum, then it is lost. I believe its heart remains the traditional working classes and that those people, by a significant majority, support Leave. I may be wrong, but Christ I hope not – I would consider that beyond tragic. Yes I am aware that the EU is a social democratic institution onto which has been bolted a technocratic neoliberal monetary/financial regime, and that this regime severely constrains social democratic policies in the EU. This was clearly illustrated by the Troika’s treatment of Greece. And I accept that while there would be a period of transition it won’t be a disaster, but there is likely to be a recession, however I still do not think that leaving the EU is a good idea for the UK. I think it was definitely valid for Greece mind you. First off a no deal will cause initial chaos – it would cause supply problems for the UK, some of these would be long lasting. And this won’t be because of economic reasons, it will happen because the UK will suddenly have to demonstrate they comply with a whole raft of EU legislation – this will affect exporters, and interestingly no plane will be able to fly from the UK to the EU the day after we exit with no deal. Secondly, while the EU is a technocratic neoliberal institution, the UK is largely insulated from this. We have a fiat currency, and nor do we have to comply with the fiscal compact, neither does the ECB dictate economic policy. Economically, my intuition is that being in or out of the EU will only make a small difference in the long term – the biggest impact would come from our EU partners, who we do most of our trade with, and nothing about that is going to change. Nor do I believe that UK exiting will cause a significant enough crisis to induce change in the EU. Thirdly, and this bothers me most, is that there are significant and powerful elements within the UK, whose main problem with the EU, is that it is not neoliberal enough! So when Brexit was being discussed, a member of the UK cabinet began seriously discussing the UK leaving the ECHR – and it doesn’t take a genius to figure out why they would advocate that. Being in the EU does provide significant protections to me and my fellow citizens in the UK, which can not be easily circumvented, and we do not have a written constitution – we have a constitution based on precedent. And so one of the consequences of leaving the EU would be a slow erosion of protections & rights. Now this wouldn’t matter, if we didn’t have the people we do in charge of the Government currently, and while you argue that this is subject to democratic change, I personally have very little faith in that happening. The UK is actually quite a conservative nation, and sadly a neoliberal psyche is embedded in a vast swathe of the voting population. It is astonishing to note that the two main parties are pretty much neck and neck, despite the utter chaos happening within the Conservative party. Thanks for the clarification, in the light of which I willingly retract my previous comments. From your wording it did appear (and not only to me, evidently) that you were identifying exiting the EU as a right-wing project and it’s now obvious that you were very far from meaning that. Having got that hiccup out of the way :-) I’m now able to see what you were actually getting at. I’ve no basis upon which to form any opinion of my own as to the feeling within in the ranks of the Labour party’s membership, and am more than content to rely on that of an insider such as yourself:- an example of that rare and endangered species, a party loyalist who uses his head. That must put you and others like you in a very uncomfortable position, for which I’m sure you have the sympathies of many outsiders – if that’s any comfort. But I still wish that Corbyn had had the guts to come out and roundly declare his real position instead of equivocating. It’s not as if it’s not crystal clear to any informed observer from his record what that position has to be (assuming he has any integrity at all which personally I do judge him to have). Why not show his true colours instead of sailing under false ones – or none? I believe he’d earn a lot more respect if he did that. But of course it would mean that he had begun to adopt the role of *leader* – a role which seems to be anathema to him. So why did he run for *leadership* of his party if that’s the case? “Being in the EU does provide significant protections to me and my fellow citizens in the UK, which can not be easily circumvented, and we do not have a written constitution – we have a constitution based on precedent. And so one of the consequences of leaving the EU would be a slow erosion of protections & rights”. To me, to state that we citizens of the UK are in the position of having to rely on a supra-national entity for protection of our rights against our own government reads like a classic description (if it is accurate) of a condition best described as “abject dependency”. Moreover, it’s in direct contradiction to the whole of our history over the past millennium and up to the present. It may be that that is indeed the position that the British polity has now been reduced-to. However, call me a cockeyed optimist but I don’t think so. I read it as just another variation on the “Britain needs a written constitution” theme. Perhaps we do, and perhaps we don’t. Not having a written constitution does not necessarily and automatically lay us open to becoming a tyranny – it hasn’t up till now so why should it going into the future? Written constitutions, on the other hand, can suffer from drawbacks of their own – chiefly that they’re prone to becoming sanctified and ossified. The gun lobby in the US bases its argument on the wording of a specific passage of the American constitution, which was drafted in 17– with an utterly different (one could argue directly opposite) purpose in mind, under unrecognisably different social and political conditions; yet here it is being egregiously exploited by a minority in the 21st century to uphold and sanctify a position which by civilised standards is morally-indefensible. Personally I don’t accept that the British polity has become so degraded as to be incapable of reflecting, via the ballot-box and thereby Parliament, the will of the electorate. By definition that’s going to mean that at any given time a certain proportion are going to be dissatisfied with it – but so long as the composition of the disaffected portion constantly alters so that, over a sufficient timescale the views of the great majority are *in the aggregate* reflected, I don’t see that there’s much to complain about. I would argue that our system has by and large historically achieved that outcome and I can’t see any reason to suppose it won’t go on doing so. Surely, it’s all about a state of mind – on a scale ranging from foolish over-confidence to deep, possibly self-fulfilling, pessimism and defeatism (somewhat like France on the eve of WWII)? The best place to be on that scale is somewhere in the middle – preferably tending towards the optimistic end. That can be self-fulfilling too. for attacking neo liberal driven austerity.The rest of europe doesnt even have any hope. Green new deal in the US is the only development gives me any hope. the left in the uk unable to support a right wing driven brexit. militant phase, i would not dream of wasting my actual time for such incoherence. I wasn’t suggesting that we are relying on the EU for protection in the sense that the EU would reign in the potential worst excesses of future UK Governments, rather my point was about how leaving the EU would open the door to erode protections already in place, by this Government. And there are sections of the current UK Government for which this is one of the motivating factors in leaving the EU, and we know this because those segments keep saying so at regular intervals. I particularly do not want this Government to have the ability to negotiate free trade agreements, because there is a very high likelihood they would end up serving the interests of supranational corporations, and that those interests would be contrary to the interests of UK citizens. On the point of a constitution, yes I accept that they can be misappropriated, however they also resolve several fundamental issues. Take the referendum for instance. This was implemented primarily to manage the threat of UKIP, and to manage the Conservative Party’s own anti-EU wing – it was about holding onto power. In general UK Governments are extremely reluctant to hold referenda for obvious reasons. Referenda should only be held when there is a good constitutional reason for holding them, and not as a tool to prop up the party in power. The other issues with the referendum is that the result was advisory, and there was no minimum majority threshold. The partisan campaigning was yet another significant issue. And the outcome of the referendum has been to create significant and serious national divisions, the latest of which is the current debacle going on in our parliament at the moment. However this ignores the nature of the UK parliamentary democracy, which delivers large parliamentary majorities with a minority voting share – and both main parties suffer from this. And the FPTP system creates a situation where a relatively small number of people have disproportionate voting power – as they hold swing votes, so both main parties focus their policies onto attracting this relatively small group, safe in the knowledge that their supporting base will vote them, because there is no one else to vote for. And 10 years is a long time to wait for the levels of dissatisfaction to rise to a sufficient level to create a swing. Because there been several significant and I think startling changes in as little as 8 years. I don’t know if you follow social policies such as Universal Credit, the Home office Immigration, NHS, Mental health, education & social care. There has for instance been a paradigm shift in how the DWP views and treats benefit claimants – work conditionality has been massively extended, and is now reaching into those on in work benefits. The system has been created to be deliberately dehumanising & to create fear in its applicants. What we are witnessing is just how a neoliberal system is readied and prepared to be accepted by it’s population. Have you ever wondered just why it is that DWP press releases are so bland? “The outcome wasn’t complex – it was clearly to Leave.” The outcome only seemed clear because the the question asked did not reflect well the political reality. As deliberation after the referendum showed there should have been three questions, no-deal, deal, remain. Neither no-deal nor deal have a majority. In fact, each of no-deal and deal command less support than remain. The British don’t want no-deal and they don’t want a deal. I don’t see how any other decision than to remain is possible now.